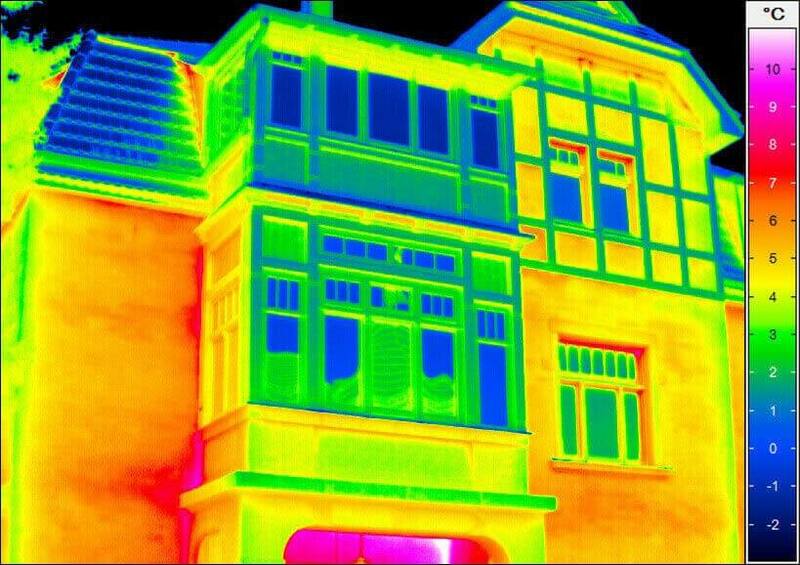 Building thermography requires mobile thermal cameras with all technical facilities, which allow for professional operation. With the product series VarioCAM® High Definition and VarioCAM® HDx, InfraTec offers an assortment of thermal cameras, which are an indispensable and universal tool for demanding thermographic measurements. The application of microbolometer FPA detectors of the newest generation makes high-resolution data acquisition and image reproduction with up to (2,048 x 1,536) IR pixels possible. The image reproduction is done in real time on a digital 5.6''-TFT-display. Despite its outstanding performance characteristics, the camera distinguishes itself with its low weight. Where are the insulation faults? Where can conception-induced thermal bridges be located? Are there any hidden constructional defects? Thermography is of great importance to leak detection: egress points of pipes can be diagnosed pinpoint to allow for targeted opening of walls and floors. Our mobile thermal cameras let you assess constructional problems reliably with only little time expenditure. The VarioCAM® High Definition and VarioCAM® High Definition HDx with their numerous individual specifications are perfectly suited for the professional and universal applications of building thermography.